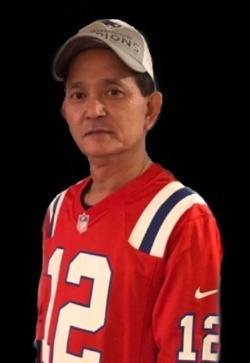 Obituary for Pheuy Boupha | Boucher Funeral Home, Inc.
Pheuy Boupha, 50, of Gardner, died peacefully Tuesday, January 15, 2019 in his residence following an illness. Born in Pakta, Laos on March 2, 1968, he was the son of the late Heaun and Phaeng Boupha. Pheuy was a fork lift driver employed by Unified 2 of Lancaster for the past 5 years. He was previously employed by Nordam Rack of Leominster for 25 years. Pheuy loved football and was a die-hard New England Patriots fan. He enjoyed deep sea fishing, and he loved watching reruns of Star Wars episodes and Tom and Jerry cartoons. He enjoyed being outdoors even if it was only to feed the squirrels, and part of his daily routine was walking to Dunkin Donuts for his extra-large coffee. He was beloved by his family for his caring nature and sense of humor. He was the life of the party, who loved to laugh and tease all. He was the number one babysitter for his many nieces and nephews whom he loved dearly. Pheuy will be deeply missed by all who knew and loved him. Besides his wife of 12 years, Vongmany (Ratanavong) Boupha; he leaves his brothers, Boonmy Boupha and his wife Doungchanh of Gardner, Somboon Boupha of Gardner, Kuth Boupha and his wife Dafone of Gardner, Phay Boupha and his wife Keo of Gardner, and Phou Boupha and his wife Saysamone of Woonsocket, RI; sisters, Vanhkham Boupha of Gardner and Chanpang (Mimi) and her husband Ronald of Los Angeles, CA; ten nieces and six nephews. Funeral Services will be held Friday, January 18th at 12:00 p.m. in the Boucher Funeral Home, Inc., 110 Nichols Street, Gardner. Burial will be held at a later date in Wildwood Cemetery, Gardner. Calling hours will be held Thursday, January 17th from 5:00 p.m. to 7:00 p.m. in the funeral home.